I wrote a guest entry for Concocted Conversations, a Tumblr dedicated to invented dialogues about random images. 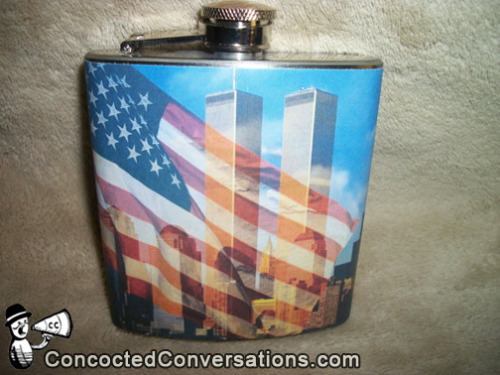 I saw a picture of this glorious 9/11-themed flask, and the words just poured out of me. Concocted Conversations is edited by the very funny Ron Babcock, who recently made a stop at The Living Room. Genevieve Rice is a Phoenix-based comedian, who I’ve met briefly at shows. Thanks to the internet, we’ve become better friends. Recently, we’ve entered the next stage of internet friendship, which is favoriting each other’s tweets. It’s the modern day equivalent of donning your hat and curtseying. You should all check out her twitter. It’s a solid one. Store Clerk: May I help you, sir? Customer: Where do you keep your flasks? Store Clerk: We keep a whole selection on aisle five. Are you looking for anything in particular? Customer: Do you happen to have any 9/11-themed flasks? Customer: Like maybe something with a picture of the towers with an American flag in the foreground? Whenever I try to sneak a few sips of the ol’ joy juice, I want to be reminded of that fateful day when the towers fell. Customer: That’s okay. So where can I find your Hindenburg disaster keychains? Store Clerk: We don’t stock any. Customer: Seriously?! You’re missing out on some serious business for people who like to keep their keys in one place but also honor the memory of the greatest zeppelin fire this country has ever seen. Store Clerk: You know, I do have a visor that commemorates Hurricane Katrina. Customer: Why would anyone possibly want that? You disgust me. Click here to receive monthly notices of my descent into madness.